As Pope Francis says, “Charity, love, is sharing with the one we love in all things. Love makes us similar, it creates equality, it breaks down walls and eliminates distances. God did this with us.” As we approach the end of Lent, let us concentrate on following God’s will as we journey towards the joy of the Cross and unity with our Risen Saviour. Looking forward with joy to the celebration of the Resurrection of Jesus on Easter Sunday, we have been reflecting on the importance of this liturgical season as we prepare to enter into the Triduum, the holiest days of the year. On Thursday April 18th at 10:00 am the grade 5 class will be presenting the Stations of the Cross. Holy Thursday will also include the parish Mass of the Lord’s Supper at 7pm. During this Mass we recall that Jesus gave His body and blood and taught us to care for others when He washed the disciples’ feet. The Triduum continues on Good Friday with the celebration of the Lord’s Passion and on the night of Holy Saturday we celebrate the great Easter Vigil. During this celebration our Saviour bursts out of the tomb and on Easter Sunday we continue to celebrate the Resurrection with great joy. On behalf of our entire staff, I extend our very best wishes to all families for a happy and Holy Easter. May the peace of the risen Christ bless your homes, your hearts and your families. Mite Boxes – Before Spring Break your child received a Mite Box. Students are asked to collect offerings throughout Lent and to pray for the 26 young men in our Archdiocese who are studying and discerning a vocation to the priesthood. Mite boxes can be returned after Easter. Grade 7 & 6 Retreats – On April 9th & 12th, our students will have the opportunity to participate in a NET Ministries retreat. National Evangelization Teams (NET) is a Catholic organization dedicated to spreading the Gospel to youth. Members of NET are committed to “discernment and a moral life in accord with the clear teaching of Scripture”. Please pray for our students as they grow in their love for Jesus and embrace the life of the Church. God our Father, by raising Christ your Son You conquered the power of death and opened for us the way to eternal life. Let our Easter celebrations raise us up and renew our lives by the Spirit that is within us. Grant this through our Lord Jesus Christ, your Son Who lives and reigns with You and the Holy Spirit One God, forever and ever. During the week of April 22nd, we will be raising awareness for our “common home” by engaging in several environmental activities such as waste-free lunch and community clean-up. Stay tuned for more info from our Student Council. Our Earth Rangers Assembly on April 24th is a 45-minute dynamic, interactive, multi-media experience that features LIVE Animal ambassadors demonstrating their natural behaviors. Students will learn about the importance of protecting biodiversity as well as some of the conservation initiatives across Canada including conservation projects for the Ringed Seal, Piping Plover Monarch Butterfly and White Sturgeon. 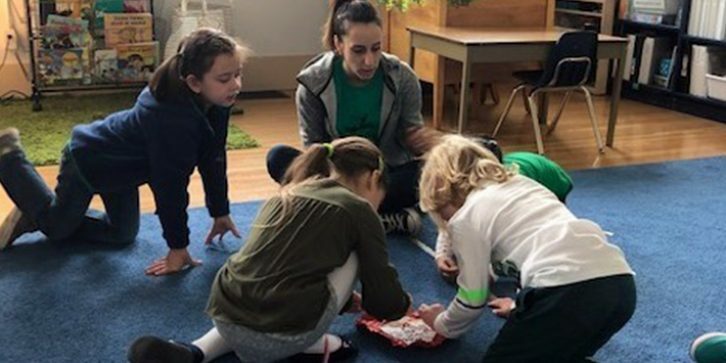 The Grade 7s are continuing their community involvement this spring by volunteering every month at the Cascadia Centre, which promotes the well-being of adults with special needs through artisan (such as pottery, weaving and candle-making) and artistic training. Our students will be lending a hand to the instructors, forging friendships with the participants and learning new skills! Please notify the school before 9:00 a.m. to report your child’s absence either by phone or by e-mail office@stedmunds.ca. Written correspondence is required stating the DATE and the REASON for the absence. Our attendance and absentee notes are audited to determine the grant we receive from the government. To receive full government funding, students must be in attendance a minimum of 600 hours by May 15th. Families of students not meeting this requirement may be billed to make up the difference in funding. Students who arrive after 8:45 a.m. must come to the office and check in with Mrs. deFreitas or Mrs. Sharp. All students must adhere to the school uniform policy and present themselves in a neat, tidy and appropriate manner while attending school and school related events. Regular school items must be purchased from our school supplier, Cambridge Uniforms and shoes must follow the uniform requirements. Gym strip items can be purchased from the school on Tuesdays & Thursdays. Items should be clearly labeled with your child’s full name as many students share the same first name or initials. We look forward to your continued support in doing your utmost to ensure children are dressed appropriately each day and to communicate to the school if you have any questions of concerns.